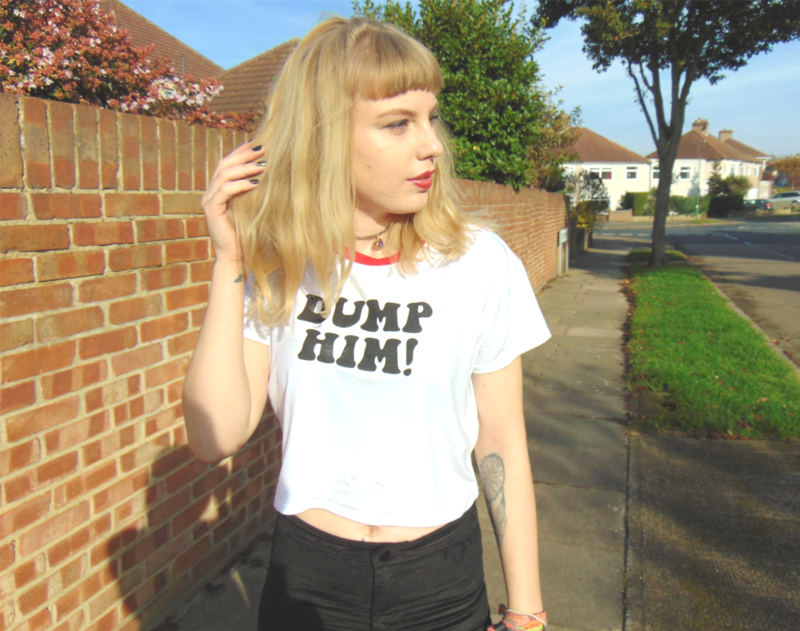 Yes, dump him indeed - because why wouldn't you do what a t-shirt tells ya too? Joke, I love this top, and its 70's vibes. Thanks for that one, Missguided. It also goes perfectly with ma new *New Look boots. New Look recently asked me to style up a pair of their boots in both a day time and a night time look (see the full collection of New Look boots). 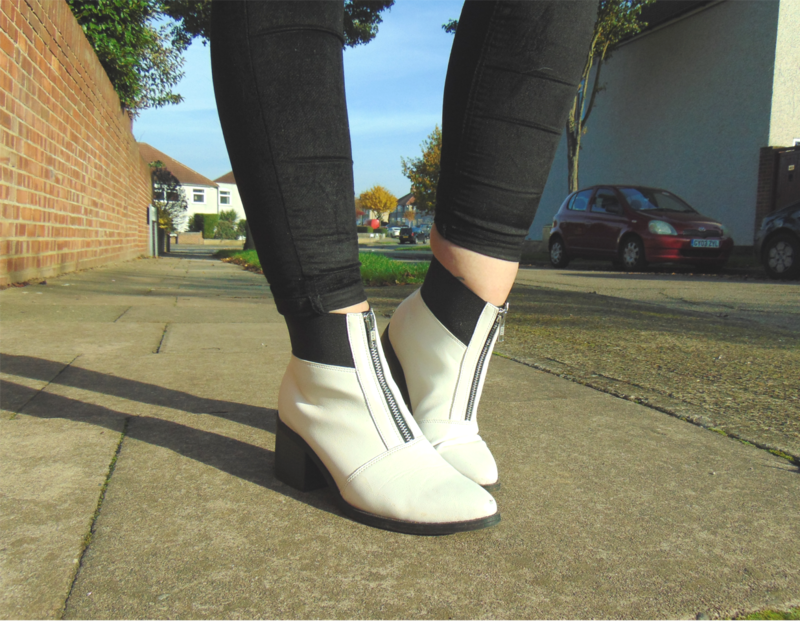 I've been wanting a pair of white boots, and a pair of pointed boots rather a lot recently, so I had to go with these beauts. Fave part has gotta be the zip detail at the front - it adds a bit of edge and sass to them. Always what I need. I went very casual for the day time look. I was actually a little worried this look might be a little boring for the blog, but velvet jeans and a ringer tee with a quirky slogan in groovy 70's font, seemed pretty blog-worthy in the end. I'll be posting the night time look on Friday! Love those shoes, can't believe they're new look! I love that shirt on you, Alice. Simple be damned -- you're sassy and lookin' snazzy. Those boots are so gorge! Really cute outfit as always, and I am SO in love with that top! oooh those boots are awesome! This are amazing - so unique! these are super nice, that top rocks too! Other than trainers I would never think to go for white shoes but theses look amazing!! So effortless and stylish. The top is fab too! I've been looking for a nice pair of boots now it's autumn and these are gorgeous ! I love newlooks boots they're always lovely AND affordable which is .. you know, a nice combination hehe ! I personally think a lovely outfit like this with a 70's top and black skinnies is blog worthy and this was a great post :) I can't wait to see the night time look ! The Boots. I need The Boots. Those boots. yesterday. As always, you look fantastic! Great look! Those shoes are so great! Such a fun look! Loving those jeans and the boots are really unique - great outfit! I am loving the boots! New Look is always my first post of call for shoes, their collection is amazing and so affordable. I think you styled these boots very nicely in this outfit for a day look :) It looks a bit sassy, which is always a nice add! hehe love the cheeky shirt! awesome boots, really! truly in love! I love New Look! Those booties are so cute! And I love this casual, edgy and fun outfit! This is such a cute look, you make those boots look so rad. I also love those jeans! Velvet is my life. Shame they are Topshop tho, so they'll be a lil' out of my price range haha. I want those lovely white boots!!!! Love this outfit. The boots are so cute. I almost can't believe these are New Look, i often shop there for shoes but have never seen boots like these! 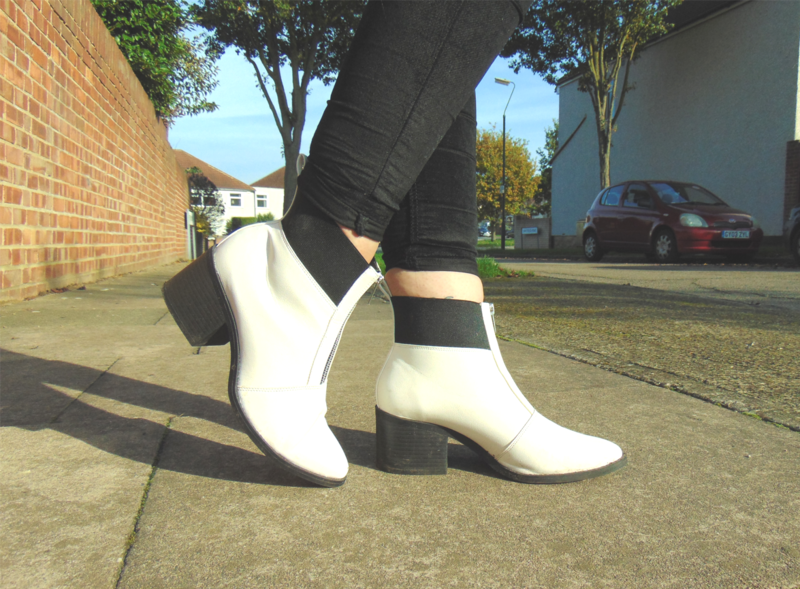 I am not a fan of white boots but those are amazing. Looks beautiful. I ADORE that tshirt!! Fellow Portsmouth graduate woop woop!